Nikko in Tochigi Prefecture and Aizuwakamatsu in Fukushima Prefecture are ideal destinations if you'd like to take a trip through Japan's history! We introduce here a route that will allow you to learn more about the dignified samurai! Japan's samurai are stuff of legend. But what were these acclaimed figures really? And how are they remembered in Japan today? While legend has its place, the real weight lies in history. So, let's take a trip of a lifetime to experience a little bit of the samurai legend and put together some pieces of the past! For the culturally curious and the history buffs, this is a 2-day Samurai Course Trip to Nikko, where the shrine of the Tokugawa family is located, and Aizuwakamatsu, the setting for the last battle of the samurai. Nikko is a famous sightseeing area near Tokyo, drawing people from the world over to for its historic, small-town feel, as well as its World Heritage Sites. These include Nikko Toshogu Shrine, where we will pay our respects to Tokugawa Ieyasu, the founder of the Tokugawa Shogunate (Edo Era). After a quick breath of early-morning tranquility at Sensoji Temple, let’s board at Asakusa Station the Tobu Limited Express Revaty, departing at 9:00. This train will bring you directly to Nikko. You can buy tickets at the Tobu Ticket Office on the first floor, or through the ticket machines. A ticket from Asakusa to Nikko costs 2800 yen. 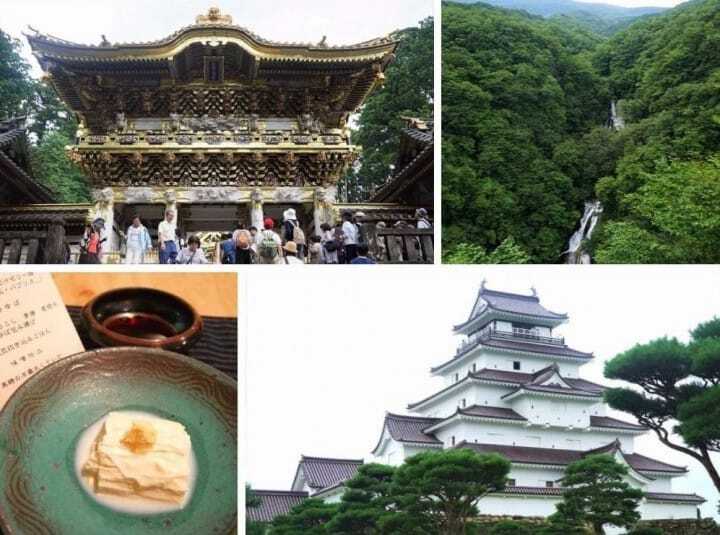 There are several TOBU Discount Passes for one-day trips or two-day trips to Nikko available at the Tobu Ticket Office, such as Marugoto Nikko Free Pass or the Marugoto Nikko - Kinugawa Free Pass. These convenient discount passes include unlimited train and bus rides in the Nikko area, plus discounts at partner shops and dining places. If you'd like to make the most out of your time in Nikko, please consider purchasing one of these free passes. The train ride with the Rivaty to Nikko takes about 2 hours, which goes by in a flash. The seats are comfortable, there’s free WiFi, and an outlet in the armrest to charge electronic devices. Once you’ve arrived in Nikko, head to the tourist center right outside the ticket gate of the Tobu Nikko Station to buy a bus ticket. For this trip, we’ll be getting the Kiri Furi no Taki Free Pass. This pass will allow us to ride buses to key World Heritage Sites, as well as a beautiful waterfall, on one 600 yen ticket. Be quick and line up for the bus at the large stop in front of Tobu Nikko Station. Either the 2A or 2B bus will work with your Free Pass. As it can get crowded, get on whichever comes sooner (or is more comfortable), and find a seat. We're getting off at Shinkyo bus stop, our go-to stop for hotel, sightseeing, and ...lunch! Since it’s nearing noon, why not get some good food before sightseeing? Near the Shinkyo Bus Stop, there's a highly recommended café restaurant with an at home atmosphere and seasonal Yuba Tofu (Nikko's acclaimed tofu skin dish) course menu, called Yuba Kaiseki Lunch, available for 2700 yen. For lunch there are two courses to choose from, which are served beautifully one by one. Yuba tofu is the delicious highlight! With a homey feel, a garden attached, and staff who can speak English, at Nagomi Cha-ya you can enjoy a relaxing and peaceful lunch. Access From Tobu Nikko Station, take a bus heading for Yumoto Onsen or Chuzenji Onsen and get off at Shinkyo bus stop. It's a 1-minute walk from there. From the restaurant, it’s a short 10 minute walk to our main destination, the World Heritage Site, Toshogu Shrine. Built in 1617, Toshogu is where Tokugawa Ieyasu, the founder of the Tokugawa Shogunate, is enshrined. Many come here to pay him respects by climbing hundreds of stone steps to visit the bronze urn that houses his remains. Toshogu Shrine has five structures and two swords considered National Treasures of Japan. This includes the shrine's massive stables, fit for warrior steeds, which has carvings you might recognize: the three wise monkeys and their legendary tale. To get to the main shrine area, and to make your pilgrimage to Tokugawa's grave, buy a ticket at the reception desk for 1,300 yen. For those with the time to enjoy it, renting an English audio guide here for 500 yen is highly recommended. Now, let's pay our respects at Tokugawa Ieyasu's grave. Enter the glowing golden entrance gate, guarded by fierce red warriors to either side, and make your way to the path at the far side of the courtyard. Before starting your ascent, be sure to check out the legendary “nemuri-neko” (sleeping cat) above the inner archway. This sleeping cat, indeed the only one of its kind in the shrine, is said to represent "peace". On the way out, you can buy your own bit of peace if you want by purchasing a souvenir “sleeping cat” charm. A stone path in the forest and a number of stairs will take you to the grave. You might feel like complaining, but don't give up! Because, passing around it, many people are struck by the size and solemnity, as well as the peacefulness, of this resting place. After visiting the grave, look around the grounds more fully, or head to the art museum. At 15:00, though, head to the nearest bus station. You can take a bus from Toshogu Shrine itself, from a stop directly off to the side of that initial long gravel road. Be sure to show your pass when you get off at Tobu Nikko Station. This time, we’re headed into a more natural setting: to a mist-covered, hidden waterfall. Once at Tobu Nikko Station, head to this smaller stop (to the right when you exit) - bus stop 2D. The ride itself may only be about ten minutes long, but be sure to plan carefully around the route schedule. The bus itself only comes a few times per hour, and last buses are earlier than you might expect. When you arrive at the destination, the Kirifuri no Taki Bus Stop, you will notice a restroom, a restaurant and souvenir area, and a few large arrow signs. These signs point the way to the lookout point of the waterfall. Let's go! It is a pleasant trek through the woods, with lots of green, cobbles, and moss-covered turns. It’s not a very difficult trek, but be careful of slipping! At the end of the path is a wood-deck lookout point. When you step down, you'll hear the falls before you see them. Isn’t the waterfall gorgeous? From the farthest end of the wood deck, the view is lovely and unobstructed. This place will be breathtaking in the fall, with the colors of changing leaves, and in the spring, with blooming flowers. After enjoying the view and snapping some pictures, wander back toward the souvenir place near the bus stop for ice cream and snacks. Or, maybe stop for cake at the cafe near the opening to the path. Just be sure to be back on the bus by 17:13 at the latest. This is the last bus back to the town. Hope you didn’t fill up too much snacking throughout the day! The room we reserved at the Nikko Kanaya Hotel comes with a full course dinner! The hotel is near the Shinkyo Bus Stop we got off at this morning, so head back on by the same route you're familiar with. If you care for a stroll through Nikko, you can skip the bus and walk to the hotel from the station there in about 30 minutes. Nikko Kanaya Hotel is the oldest Japanese resort hotel in Nikko, with over 100 years of history. At its roots is the Kanaya Cottage Inn, which was first established in 1873, shortly after the Meiji Restoration, to serve as a place with western aesthetics for visitors to stay. Since it became a hotel, it has seen famous overseas guests like Helen Keller and Albert Einstein! The walls are decorated with the hotel’s past, but you do not have to look at photographs or artwork to feel this hotel's history. The rooms themselves are spacious, and some even have the quaint touch of older bathtubs. We opted for dinner and breakfast to be included with our stay, so once checked in, head to the dining room with your meal ticket between the hours of 18:00 and 20:00. A full course menu and local spirits - a luxurious meal, and a great way to wind down the day. Access 5 minutes by bus from Tobu Nikko Station or JR Nikko Station. Get off at Shinkyo bus stop. 3 minutes away by foot from the bus stop. This is going to be an exciting day, one I could hardly sleep anticipating. We’re headed to Aizuwakamatsu in Fukushima. Otherwise known as the Samurai City, Aizu is the location of the last battle of the samurai before the advances of the Meiji (1868-1912) government. The morning view of the mountains from the Kanaya Hotel room is absolutely stunning! Let's get refreshed, drink some complimentary tea, and head to the dining room with our breakfast ticket. The morning light in the dining area makes breakfast, a menu of eggs, toast, and juice, feel like slipping back in time! It feels like there's not a rush or care in the world. But let's make sure we don't overstay. Check out by 8:30 AM to get to our next destination! If you have time, stop by the shop on the way out to purchase the hotel’s famed bread, or maybe to get an hotel notebook or folder souvenir to remember your stay. The way to our destination station, Nishi-Wakamatsu, can be a bit confusing, so do ask the station staff at the ticket office to help you purchase your tickets. Depending on the time of the day, you may receive one ticket or you may receive three. Please hold on to all of them to hand over at the last station once you arrive! Change trains at Shimo-Imaichi, and then again at Kinugawa Onsen Station for the Revalty AIZU train. Now starts the exciting part of the train travel! For about 2 hours with a wonderful view, you get to enjoy a train with a unique atmosphere. You'll arrive at Nishi-Wakamatsu Station at 11:54. Please be sure to ask the station master any questions you have, about taxis or buses, when you hand over your tickets. We've made it to the Samurai City! Let's go to Tsurugajo, Aizu's acclaimed castle! If the weather is nice, it's an enjoyable stroll of less than 2 kilometers. Tsurugajo! An impressive site, and an important part of the Aizu area's history. In 1868, during the Boshin War, this castle saw the Aizu samurai, as a part of a greater coalition of rebels against Imperial power, hold out under attack until October when they were besieged. Many lives were lost in this last samurai battle. This includes a tragedy that still resonates with the locals: 19 teenage members of the Byakkotai (White Tiger Force), a group of about 300 young Aizu domain samurai, committed ritual suicide after watching Tsurugajo fall. To make the most of your visit to this historical place, stop by the tourist information office outside the castle walls for assistance and maps. Afterward, head to the ticket office near the castle entrance. A ticket for castle entrance is 410 yen for adults. The castle is five stories high. The floors from the 1st through the 4th serve as a museum, with English signs as well while the very top is a lookout point to take in the surrounding view. If you're lucky, you might even see Mount Bandai in the distance. If you go during the spring, you'll be able to take in hundreds of blooming cherry blossom trees on the grounds below, a breathtaking spectacle! Access From Aizu Wakamatsu station, get on the city loop bus Haikara-san and get off at Tsurugajo iriguchi stop and walk five minutes. Price Adults: 410 yen, Middle school and elementary school students: 150 yen. After finishing up at the castle, turn a few corners and head to Tsurugajo Kaikan for lunch! Tsurugajo Kaikan is a key port for tourists. It sells local goods, food and gifts, and can give you a fuller view of Aizu personality and flavors. The center's staff are bright and kind, selling homegrown vegetables and local crafts. Hungry guests can eat handmade soba noodles, stop at the café, or take a meal at the cafeteria. The Aizu area has a few key folk items. This includes the Akabeko (red cow), the okiagari koboshi (small puppets), and painted candles. For a unique memory, you can buy one of these to take home or create your own in the Kaikan's craft space. After lunch, head out front to a green bus stop and wait for the green Haikara-san tourist bus. It costs 210 yen to ride and comes every 20 minutes. We're heading to Iimoriyama Shita Bus Stop. On Mount Iimori there is a fascinating temple that cannot be missed: Sazaedo Temple, which is also an Important Cultural Property of Japan. Built in 1796, Sazaedo is no ordinary temple. This slightly ominous structure is a unique "double helix" staircase! Those ascending and those descending never meet. This means that you may hear their footsteps above you, but you won't run into each other. To get there, you must climb the hundred stairs (or take the escalator next to it for a fee) up the road from the bus stop. Once at the very top of the stairs, turn around and look out at the city. Slightly below you to your right, you will see a split path with a number 8 road sign. Follow this path to Sazaedo. The inside is a continuous circular slope that peaks in a bridge at the top. Going through the tower, the ascent and descent, is said to be equivalent to the Saigoku Kannon Pilgrimage to 33 Buddhist temples and can bring good luck. After exiting, go down a slope with a number 10 road sign, and take some time to explore the Mount Iimori spiritual monuments. Head back to the green bus stop when you're ready for a ride to the station. Please be careful of the time, as there are few trains into and out of Aizuwakamatsu. For those who are able, it is highly recommended you spend 3 days for this course by staying overnight in the Samurai City. This will give you more time to explore at leisure, and you can even head to a world-renowned hot spring resort nearby, like the Kinugawa Onsen, for a relaxing stay. Those who are limited on time and cannot stay overnight should make sure to be at the train station in time! This means before 17:00 at the latest, to get back to Tokyo. To get back to Tokyo, first we will board the JR Ban'etsu West Line train at Aizu Wakamatsu Station toward Koriyama Station. At Koriyama, we will take the shinkansen (bullet train) to Tokyo Station. The whole trip will take about 3 hours. I boarded the 16:21 train and made it to Tokyo Station by 19:28. Be sure to show the station master at Aizu Wakamatsu Station's ticket office your destination, and purchase your tickets. Also, for the ride, why not buy a local drink and lunch box? I opted for Aizu Coffee Milk and food with Aizu seasonings. It was a lovely ride home through beautiful mountains with good food. This sums up our Samurai Route Trip to Nikki and Aizuwakamatsu, which are both fascinating, history-filled places. When visiting Tokyo, how about taking a two-day trip to this area? Accommodation: from 21,600 yen (tax included) for a Standard Twin Room with dinner for two persons. *The room prices may change depending on the season and the selected accommodation plan.